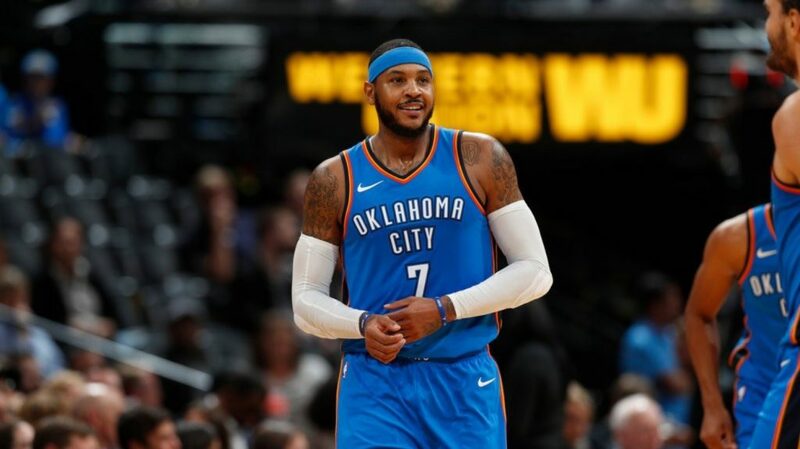 In a move many around the league have been anticipating since his trade to and subsequent buyout from the Atlanta Hawks, free-agent forward Carmelo Anthony today put the pen to paper on a one year, $2.4 million contract with the Houston Rockets on Monday. The 34-year-old Anthony figures to provide valuable bench scoring at a low price for Houston, a team looking to break through in the deep and talented Western Conference. While it had previously been reported that the veteran, who last season played for the Oklahoma City Thunder, would be looking for a starting role on contender, the opportunity to play alongside Chris Paul and James Harden proved too alluring to pass up. Though Anthony has seen his production numbers drop over the past few seasons, he’s still a talented scorer with a veteran’s mentality, the kind of player that any title contender would love to have. After a season in which Anthony oftentimes played in the shadow of young bucks Paul George and Russell Westbrook in OKC, a move south to a team more complementary to his skill set can only be a good thing. Sharing the court with the notoriously unselfish Paul figures only to help boost Anthony’s numbers. An instrumental factor in the signing of the 10-time All Star may have been his close relationship with Chris Paul, a fellow future Hall of Famer with whom he’s shared a friendship with for years. Houston’s pursuit of Lebron James may have ended fruitlessly, but the acquisition of Anthony will help to aid the Rockets on their quest for a ring.